In Paris, life in an adopted city goes on. A couple of weeks ago, I decided to explore the famously boho-chic Canal Saint-Martin. I was headed to Du Pain et Des Idées, a boulangerie that often tops the list of best bakeries in Paris. Getting off the metro at Colonel Fabien, I walked down the Rue de la Grange-aux-Belles, strolling by the Rue Bichat before crossing over the canal, blissfully unaware of the horror that would ensue there just two weeks later. The morning after November 13, I went back and reread the article I had published a week earlier about my Parisian study abroad experience. As I analyzed my account from the safety of a London flat, where I was staying that weekend, the magic and beauty I evoked now took on an eerie tone, cloaked by the confusion and heartache following the worst terror attack on French soil since World War II, taking place in an area not far from my homestay in northeastern Paris. Though I spared my loved ones some anxiety by having been away from Paris for the weekend, the prospect of my impending return was saturated with uncertainty and fear. At first, I couldn’t really process what was happening from afar. With two full days ahead of me in London, I didn’t know how I’d be able to look past the tragedy to enjoy myself at the most basic level. I felt victimized in a way that’s hard to describe. Paris has been my home for almost three months, and to have that home attacked made me feel incredibly vulnerable. Not once during my time in France have I ever felt in danger, making the sudden violence all the more shocking. So many questions follow a tragedy like this. How could this city—this beautiful city that I’ve grown to love filled with people who have changed my life—be targeted in a ruthless massacre of innocent lives? Will I ever be able to go out again and truly feel safe? Will my family and friends back home ever stop worrying about my remaining stay in Paris? Even though no one I know was directly affected by last week’s attacks, the emotional aftershock of the incident is difficult for me to ignore. The sounds of sirens frighten me, the sight of armed officers disturbs me, and I have a sense of always living on the edge every time I go out. Perhaps the hardest thing for me to deal with is the idea that one of the victims could have been me had I remained in Paris over the weekend. It could have been anyone. As much as I want to continue living normally, the events of last week are still too fresh in my mind. On Tuesday night, I went to see the last “Hunger Games” movie at a theater on the canal, on the one condition of having a clear shot to the exit if necessary. The fact that a thought process like this is the result of terrorism is nothing short of disgusting. Though the events of last week are still undoubtedly on everyone’s minds, one of the things I’ve learned about the French is their steadfast determination to keep going, even during the most trying times. While I notice enhanced security measures that have since been instated in Paris, civilians seem to be continuing about their daily lives as if nothing has changed. Fear does not control them. There are just as many people enjoying a sunny day sitting on the sidewalks of those iconic Parisian cafés as there were just a week ago. Perhaps even more touching is the sheer number of people who convene in the Place de la République to pay their respects to the victims and their loved ones. Candles, flowers, wreaths, drawings, and calls for peace cover the monument at its center; it is a place of mourning for Parisians, a place now protected around the clock by French gendarmes as people from around the world come to stand together as one. The grieving process will be long and difficult for the people of France, as well as for all the other cities in the world that are currently suffering the horrendous consequences of terrorism. However, I have no doubt that the French joie de vivre will make its much-anticipated return. 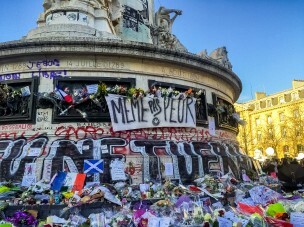 The three core values of liberté, égalité, and fraternité perhaps call for a fourth addition: solidarité.